2. 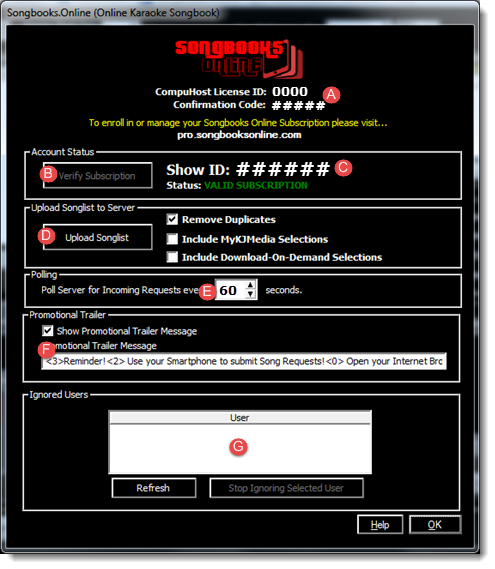 The Songbooks Online Dialog (Figure 1) will appear. 3. If you haven't already done so, take note of your CompuHost License ID and Confirmation Code shown at the top of the dialog (A) and visit pro.songbooksonline.com to enroll in Songbooks Online. 4. Once enrolled your assigned Show ID and Subscription Status should be provided (C), if not ensure you have a reliable Internet connection and click the "Verify Subscription" button (B). 6. By default, a special "Promo-Trailer" is automatically added to your Onscreen Scroller reminding your audience of this exciting new feature addition to your show, along with your assigned Show ID. You may activate/deactivate and edit the message if you so desire (F). 7. That's it! To activate Songbooks Online and start receiving your first remote requests simply select "Songbooks Online -> Activate Songbooks Online" from CompuHost's Main Menu. Remember to activate Songbooks Online at the start of every show! After updating your CompuHost Songlist in any way (song additions, deletions, Title/Artist edits etc.) you MUST be sure to re-upload your revised Songlist utilizing step 5 above.